The quilt tells the story of the Peter Blackburn Oliver family and progresses through eight subsequent generations. Included in the quilt design are family photos, family stories, poetry, the family crest, even a copy of the bill of sale for Peter Oliver’s freedom from slavery. Phillips began working on the quilt in June of 2002 and completed it on July 7 of the same year. The design of the quilt features outside rows of information and transfer photo blocks, surrounding pieced blocks of Roland Freeman’s Underground Railroad pattern on the center field. The design incorporates rich colors of purple, pink, yellow, and green, reflecting Ms. Phillips strong sense of color from her background as a dye master. Also incorporated into the quilt are small swatches of a tiny flag-print fabric, “reflecting the Phillips’ family sense of patriotism to the United States”. She enlisted the help of friends, Jean Arndt, Hattie Havig, Colleen Fox and Helen Gerdes, who helped with setting the informational blocks, piecing and setting the additional blocks and quilting the final work of art. Upon completion of the quilt, Phillips traveled to North Carolina to attend the Phillips family reunion. Phillips said, “my family members took one look at the quilt and collectively told me the quilt was not going to be placed in the raffle, that I should keep it. 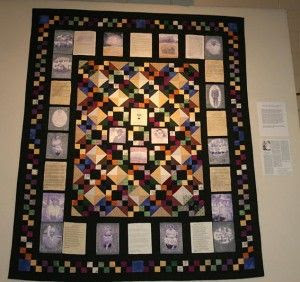 I was disappointed, at the time, but I understand now the important significance of the quilt to our family.” She continued, the quilt is a history of the challenges, hardships and accomplishments of the Phillips family over eight generations”.